Glasgow has the highest population of any town or city in Scotland, has several universities (two of which rank within the top 300 in the world) and is a highly popular tourist destination. Its relatively low unemployment rates combined with affordable housing and easy access to plentiful parkland and green spaces make it a popular place to live. It’s easy to achieve a decent work-life balance here, too: it’s a vibrant city with plenty to keep residents and visitors entertained on evenings and weekends. Glasgow is famous for its art galleries, music scene and festivals (notably the Merchant Festival and Glasgay Festival). It’s also a popular destination for foodies thanks to its plethora of independent restaurants and cafes. If you live, work or study in Glasgow and need somewhere safe to store your belongings, equipment or business archives, we have four stores in and around the city. Safestore Glasgow North is not far from Alexandra golf course and Safestore Glasgow Central is close to Glasgow Caledonian University; south of the River Clyde you'll find Safestore Southside and Safestore Rutherglen. We’re convenient for East Kilbride, Hamilton, Paisley and Dunbarton thanks to our stores’ locations close to the major roads around Glasgow and proximity to several major railway stations. We have units in a wide range of sizes starting at 10 sq ft up to warehouses of 500 sq ft and above. 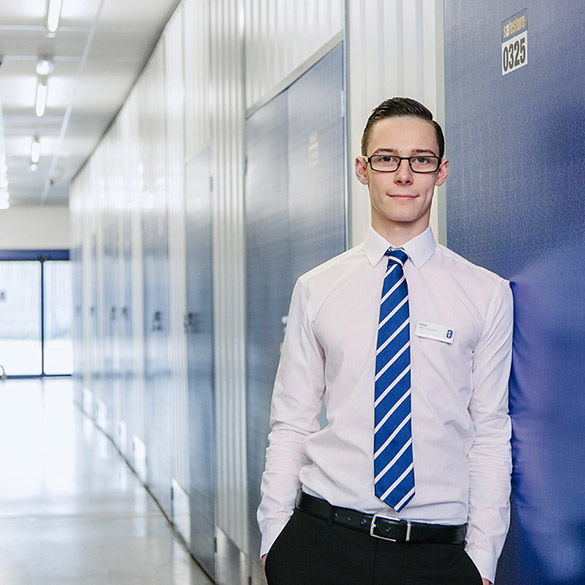 For self storage in and around Glasgow, give us a call at any of our stores, click for a quote or to reserve a unit (with no deposit). You can also complete our contact form and we’ll call you back as soon as possible. Get a storage quote today and reserve a Glasgow storage unit for free. We won't ask for a security deposit either. Get 20% off if you need self storage for longer than 12 months. Available at all Glasgow Safestore centres. Terms apply. Glasgow is the largest city in Scotland, and third-largest in the UK, with world-class shopping and internationally-acclaimed arts, culture and architecture as well as a vibrant nightlife and a diverse array of restaurants and bars. For those who live and work in Glasgow if you need a place to store your sports equipment long term or somewhere to store your furniture while you move house, you’ll find exactly what you need with Safestore. We offer a variety of different storage sizes - from small lockers to large rooms, we’ll have the right size for you. All our storage units are available both long and short term, with storing starting from a week. If you have any questions or would just like a quote, please don’t hesitate to get in contact. Talk to the team today to find out how we can make storing easy for you. Glasgow is one of Europe's most vibrant and dynamic cities, that's been voted the world's friendliest city and is a centre for the shipbuilding and marine engineering industries. Like with any major city, space is at a premium so if you need more room for your business stock or equipment, store them safely with Safestore self storage. The security of your belongings is paramount which is why we have advanced security technology at every single store with 24 hour recorded CCTV and intruder alarms. You can be certain that your belongings will be safe here with us. Scotland is renowned for being a friendly place and our professional advisors in store and on the phone embody just that. Glasgow advisors are experts in their field and can help you every step of the way through your storage journey. Safestores, in Glasgow and beyond, are proud to have been awarded a ‘Gold Trusted Merchant’ award in 2014, 2015 and 2016 by Feefo (an independant customer tracking system for businesses), commending our ability and commitment to making customers happy.